NextA history of the First World War: No. 10 The march through Belgium and German Atrocities ! Lying on the Sinai Peninsula in Egypt, the beautiful St. Catherine’s monastery today is still one of the oldest working monasteries in the world. It is truly one of the last great outposts of the Christian and Byzantine worlds. It is also these days listed as an important UNESCO world heritage site. As legend states a community of Monks asked St. Helena, the mother of Constantine the Great to build a chapel on the site where they believed Moses had seen the burning bush. So there it stood in the vast landscape at the foot of Mount Sinai, until two centuries later the Emperor Justinian had the chapel enlarged with massive protective walls. Patronized by Byzantine emperors, its Eastern Orthodox monks enjoyed considerable autonomy from the factional madness of the Orthodox and Catholic churches and their disputes. For centuries it has also stood as a place of peace, surrounded in mystery and sacredness. Not even the crusades left a trace of their passing (except for some graffiti) and today has become a place of pilgrimage and tourism. It is also surprisingly a sacred site amongst not only Christians, but Muslims and Jews too. Within the great walls of the monastery lies a Fatimid mosque, though unfortunately it has never been used because its alignment was incorrectly positioned (not facing Mecca). The monastery has gone by many names over its long history. It was known in its early days as the Chapel of the Burning Bush or also simply as Saint Helena Chapel, after the mother Constantine the Great. In the many centuries that followed it was also known as the Basilica of the Transfiguration after the wonderful mosaic that adorned the upper part of the apse. Though, finally by the ninth century, its name changed to the monastery of St. Catherine, after the martyr of the same name. Born in Alexandria 292, St. Catherine died as a martyr at only eighteen years of age. Her road to martyrdom began when she dared to protested to Emperor Maxentius about his worshipped of pagan idols. The emperor, angered by her audacity to question his beliefs, made her stand before 50 philosophers, whose job it was to break her faith in Christ. These philosophers tried in vain to make Catherine see sense and to convince her that Christ was not God. It failed miserably as she argued back at them that Christ was almighty and in turn converted all fifty philosophers to Christianity. Emperor Maxentius was apparently stunned by what had happened and immediately had all the philosophers burnt alive. He then had Catherine condemned to be tortured on the wheel, but the wheel somehow miraculously fell to pieces. Her reprieve was short lived, at which she was beheaded. Once Maxentius was satisfied, Catherine body was taken away and buried in Alexandria. However, her body was sometime later taken away by heavenly angels and carried to the peak of Mount Saint Catherine where it remained for centuries. It was at some point in the ninth century that Sinai monks supposedly found her body on the mountain and took it to be buried in the Monastery. There are some who believe that this story is nothing but a myth, however to millions of Christians worldwide, she is a veneered saint and great martyr. As well as St. Catherine’s tomb which visitors today can see on the side of the choir, there are also a number of amazing mosaics that adorn the walls of the chapel. However, so much of the Monastery is unfortunately off limits to the public. These areas include the Library of the Monastery and the Icon storage room. The Library of the Monastery of St. Catherine is surprisingly considered the second most important library in the world, after that of the Vatican museums in Rome. It holds over some 3,000 manuscripts written in mainly Greek, then Arabic, Syriac, Georgian and Slavonic. Only monks and scholars are privy to these rooms. Though scholars must seek first permission from the church arguably because of an incident that occurred in 1844. A German scholar, Constantin von Tischendorf, visiting the library discovered the Codex Sinaitirus amongst lost manuscripts and then apparently stole the Codex running off with it to Russia. He promised to return the manuscripts but never did. The loss of this extremely rare and importance bible, possibly the second oldest bible in existence, is a story in itself for another day but for now it rests in the British Museum. Attached to the library is also the Gallery of Icons. Its storage rooms contain more than 2,000 remarkable painted icons. These Icons were painted over time in the monastery or elsewhere since the sixth century. They are truly priceless ! Photo Credits: The header image of the Monastery of St. Catherine’s is by Wikipedia user Berthold Werner and is used under the Creative commons Attribution-ShareAlike 3.0 license. 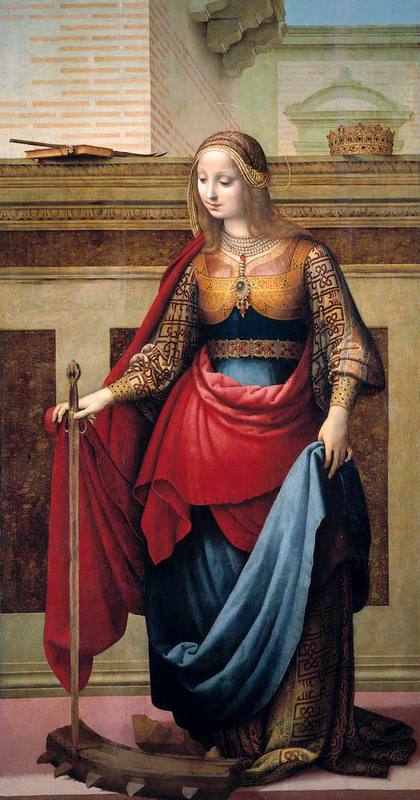 The image of Saint Catherine of Alexandria by Spanish artist Fernando Yanez de La Almedina, circa 1505-10. I’d love to visit this monastery. Indeed it is remarkable. Remarkable also because it has been allowed to remain a centre of Eastern Orthodoxy for over a thousand years in a Muslim world. If only Christian and Muslims alike had that same respect for each other on other issues today. Lovely piece. St Catherine and her monastery, peace descends just thinking of them. St Catherine is depicted as a scientist/scholar in her icon. There is a mirror between her life and that of Hypatia of Alexandria. We should all see our memorials and cenotaphs, at least once in our lifetime.